The most overlooked and without doubt the most important aspect of your whole set up when targeting any species of fish is the hook. I am amazed at how many times I see anglers targeting fish with high end braid, rods and reels yet they will have inferior or blunt and rusty hooks attached to their offering. Black Magic is a company that produce high end Japanese chemically sharpened hooks and I have been using them with success for many years. One model I hadn’t used until recently was the KL in 1/0 size which is ideal for targeting King George whiting. The KL range of hooks from Black Magic are essentially circle hooks. They offer a wide gape and shorter profile than a traditional long shank and this offers some distinct advantages when targeting whiting. First off, bait presentation is superior when using a variety of common baits such as squid, mussels, pipis and pilchard. The KL allows you to thread on the bait and cover the majority of the hook leaving the point exposed and a nice swallow size presentation. The KL 1/0 is a fine gauge hook, extremely sharp and very strong. 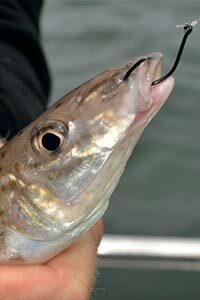 This increases hook up rate and the nature of the circle hook shape means less dropped fish. The KL and circle hooks in general alleviate the need for striking and therefore allows fish to be hooked with the rod left in the rod holder and this greatly increases your catch rate. The other distinct advantage of the KL is the fact the 95% of the time they will hook the fish in the jaw or the mouth region which allows for quick and easy release meaning undersize fish can be put back quickly and you can get your bait back in the water with speed when a hot bit is on. The economy offered from the KL range is excellent. There are 26 hooks in a pack and if washed down with fresh water after a session you will be able to re-use the hooks quite a few times, they wont rust, break and blunt easily and they will easily handle any larger fish that require some heavier drag pressure than what you’d put on to a whiting. While you may be used to using cheap red long shanks and you have caught fish with them, spending a few bucks extra on KL 1/0 hooks will catch you more fish and save you quite a few dollars in the long run!